HomeMilitary AviationF-35USMC F-35B first flight at Eglin Air Force Base. On the 100th anniversary of Marine Corps Aviation. Eglin Air Force Base, that has become famous for the improvised hangar foam party that almost submerged an F-15, an F-16 and an A-10, saw the first flight of an F-35B, belonging to the USMC, on May 22, 2012, on the 100th anniversary of Marine Corps Aviation. The STOVL (Short Take Off Vertical Landing) version of the Joint Strike Fighter, one of the three delivered to the VMFAT-501 in January, performed a local conventional flight training sortie that kicked off the process of gradually expanding the envelope to more complex aerial training, including short take offs and vertical landings. 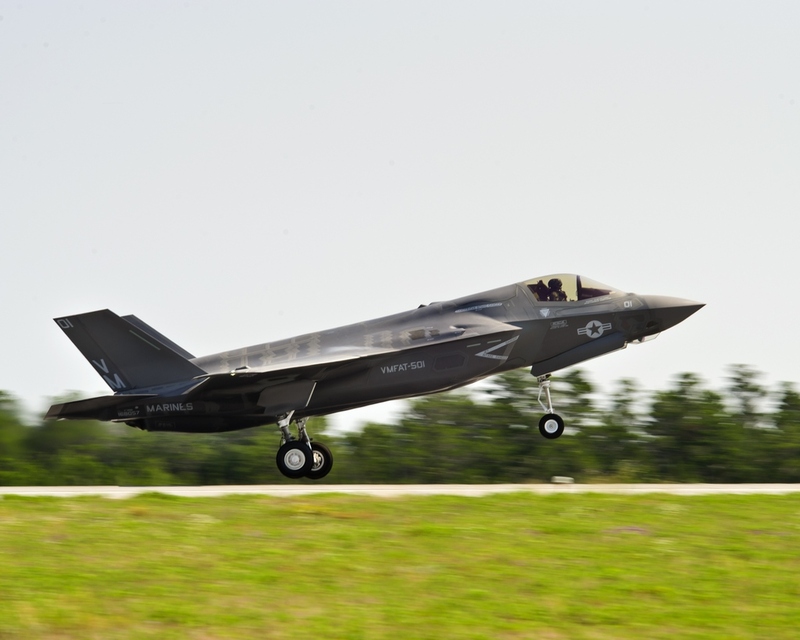 Although reporting to 2nd MAW, headquartered at Marine Corps Air Station Cherry Point, N.C., the VMFAT-501 is hosted on the 33rf FW flight line, where, since 2009, pilots and mechanics of the Air Force, Navy and Marine Corps share capabilities at the local F-35 Academic Training Center, the nation’s JSF school. Selected by the UK’s RAF and Italy Air Force and Navy, the F-35B will replace the F/A-18 Hornet, EA-6B Prowler and AV-8B Harrier within the US Marine Corps. According to the current plans, a fully-fielded fleet of F-35Bs and F-35Cs will equip 22 capital ships (11 flattops and 11 amphibious assault). Royal Air Force rescue helicopter makes "emergency" landing on a beach. To buy four Magnum ice creams!